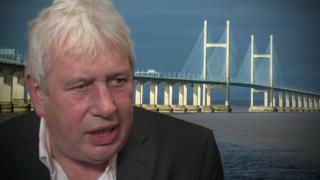 Image caption Rod Liddle said some Welsh people would like the bridge to be called "something indecipherable"
A Sunday Times article that said the Second Severn Crossing linked Wales with the "first world" has sparked complaints to a press standards body. At least 19 complaints have been received by the Independent Press Standards Organisation about Rod Liddle's piece. Plaid Cymru MP Liz Saville Roberts said on Monday that the article amounted to "prejudice". News UK, which publishes the Sunday Times, has been asked for comment. Mr Liddle's article followed a campaign launched last week against the renaming of the Second Severn Crossing to the Prince of Wales bridge. More than 29,000 people have signed a petition against the move. Welsh Language Commissioner Meri Huws said the rise in offensive comments about Wales and the Welsh language is a "cause for concern". Mr Liddle - who began his journalism career on the South Wales Echo in Cardiff - wrote: "The Welsh, or some of them, are moaning that a motorway bridge linking their rain-sodden valleys with the first world is to be renamed." He added: "They would prefer it to be called something indecipherable with no real vowels, such as Ysgythysgymlngwchgwch Bryggy. "Let them have their way. So long as it allows people to get out of the place pronto, should we worry about what it is called?" A spokesman for IPSO said on Monday morning that it had received 19 complaints about the article. He was unable to elaborate on the nature of the complaints or who complained. IPSO can require a newspaper to publish its view on the matter if it finds it has been in breach. Image caption Liz Saville Roberts said she was incensed by "his attempts to belittle the Welsh language"
Ms Saville Roberts, Plaid Cymru MP for Dwyfor Meirionnydd, told Radio Cymru's Post Cyntaf programme: "The two things in particular which incensed me were his attempts to belittle the Welsh language, and to compare poverty in Wales with England's wealth as a first world nation as something amusing." She added: "We have to ask when we should put up with this and whether or not the Sunday Times cares about readers here in Wales. "It is disheartening… it also begs the question what legal defence we have in situations like this. "Whether you describe this as racist or not, it is prejudice and is being used against us as Welsh people." Welsh language campaign group Cymdeithas yr Iaith Gymraeg also voiced criticism of Mr Liddle on Monday, and has asked the newspaper for a right to reply to the article. Robin Farrar, the group's general secretary, said: "Discrimination against the Welsh language is completely unacceptable. Attacks like this are symptomatic of a colonial attitude that should belong in the far distant past." North Wales Police confirmed that comments had been reported to the force, saying: "We are reviewing the material to ascertain if the matter should be taken further." But the Welsh Liberal Democrats tweeted: "Rod Liddle is little more than a troll seeking a reaction and with any troll it is better to rise above than to take the bait." Welsh Language Commissioner Meri Huws, said: "While it is important that we respect freedom of expression on different topics, the increase in the offensive comments about Wales, the Welsh language and its speakers is a cause for concern. "Over recent months we have seen a number of situations where people have been insulted - and this is totally unacceptable. "A few months ago, I joined with others to declare that action is needed to stop these comments, and stated that legislation is needed to protect rights and to prevent language hate. "I will now call a meeting with interested individuals and groups to discuss the matter further and think of ways to move the agenda forward." Severn Bridge name controversy: What's in a name?